The Ryukyu-Domains are since 23th of January 2015 at the Golive Period. Here you can pre-register your name among the most important New Top Level Domains like the Ryukyu-domain. Pre-registration is free, but binding. The price per Ryukyu-Domain is 60 US-Dollars/year and domain. 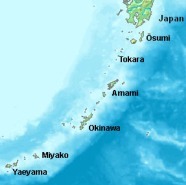 The Ryukyu Islands are a string of islands located in Southwestern Japan, the largest of the islands is Okinawa.